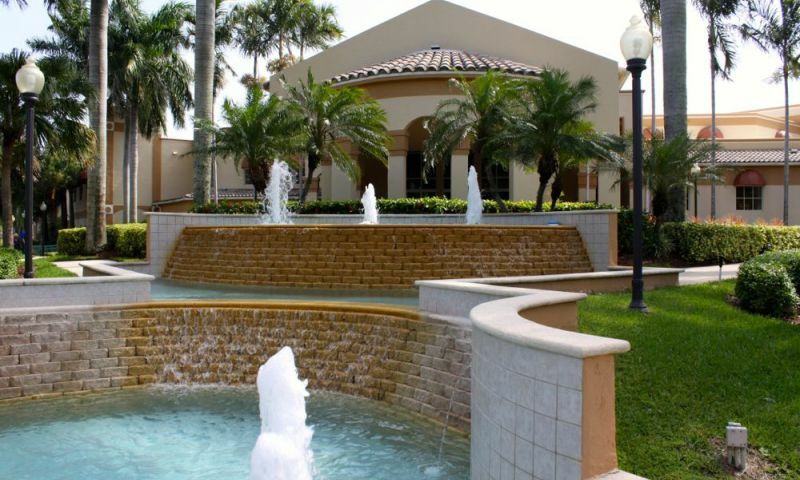 Coral Lakes in Boynton Beach, FL is an active adult community that is situated among 15 lakes and on 580 acres. Built by Oriole Homes, these include condominium buildings, villas, single-family homes and coach homes. The Coral Lakes homes have elegant interiors and inviting architecture. This gated community boasts an active clubhouse and a full-time activities director. Residents enjoy non-stop entertainment like shows, movies, and a large array of social groups and classes. The 72,000 square-foot clubhouse is the social hub of activity and socializing for active adults in Coral Lakes. The clubhouse has an indoor pool, meeting room, seven card rooms, billiards, and a lounge that also functions as a library with computer stations. A 600-seat theater showcases ballet, opera and lectures as well as in-house productions. Twice a week residents can also enjoy matinee and evening movie shows. The clubhouse is also home to a state-of-the-art fitness center and aerobics studio where residents can engage in an extensive exercise regimen. With classes like yoga, body sculpting, aerobics and Pilates, homeowners can choose their preferred activity. In addition, all can engage in fun outdoor exercise by utilizing the paddleball court, tennis courts, or shuffleboard courts. One of the popular centerpieces of the community is the sparkling outdoor resort-style pool. Surrounded by lush plants and palm trees, the pool is entirely enclosed with glass for protection from the elements. Yet, it has an outdoor feel with views of the community's lakes and desirable landscaping. After swimming or exercising, residents can wind down in the whirlpool, sauna or steam room; or simply relax on the sun deck. There are also five outdoor satellite pools throughout the community for residents to use. Coral Lakes also features an on-site cafe that serves breakfast and lunch. Choose to dine indoors in climate-controlled comfort, or al fresca on the terrace that overlooks a lake and the pool. Between October and April, the cafe staff also serves dinner on show nights. After a nice dinner, residents can take a stroll along the community's walking trails and enjoy views of the scenic lakes in the neighborhood. The community was constructed between 1993 and 2001 by Oriole Homes and residences are available on a resale-only basis. Coral Lakes is comprised of seven local associations with different home types. Coral Cove and Regal Shores have condominiums. Coral Cove has four-story buildings and Regal Shores is comprised of two and four-story buildings. Both have reserved outdoor parking spaces and offer 1,509 to 1,869 square feet of living space with two bedrooms and two bathrooms. Egret Point and Royal Landings feature attached patio homes, which contain two homes under one roof and have attached one-car garages with one to three bedrooms, and offer 1,600 to 1,780 square feet. Crystal Pointe features coach homes and villa homes, also with garages and offer 1,569 to 1,861 square feet. The coach homes have one residence over another in each home, and the villas are homes connected side by side. Regency Cove and Tuscany are two neighborhoods that have free-standing single-family homes, which are the largest residences in Coral Lakes. Both include attached two-car garages and offer 1,600 to 2,500 square feet of living space. These homes are single-story with two or three bedrooms and two or three bathrooms. Coral Lakes provides a resort-type lifestyle that is characterized by its countless activities, classes, discussion groups and classes. Choices are so versatile and numerous that even the most active adults will not be able to participate in every single activity. Organized clubs range from artistic pursuits like clay sculpting, ceramics, creative writing, friends of the arts, pottery club to sports-related groups like golf, tennis, paddleball,fishing, dance, bowling, and pilates. Intellectual pursuits are also well represented in the form of Shakespearean discussions, book clubs, current events, investment club, computer club, and movie talk. Other social events include themed dance evenings, theatrical performances, and lectures. Situated in Boynton Beach on Imperial Isle Drive, Coral Lakes is within a quick commute to historic downtown Delray, West Palm Beach City Place and Boca Raton's Mizner Park, which are all desirable destinations for shopping, dining and entertainment. Boynton Beach also has popular shopping options downtown and at the Boynton Beach Mall. The area has plenty of nature and wildlife nearby. Popular attractions for nature lovers include the Green Cay Nature Center and Wetlands, the Arthur R. Marshall Loxahatchee National Wildlife Refuge, the Green Cay Wetlands and Mangrove Nature Park. Coral Lakes is an attractive 55+ community with a variety of social activities and styles of homes to suit the needs of many active adults who chose to reside in Palm Beach County. Clubhouse - 72,000 Sq. Ft. There are plenty of activities available in Coral Lakes. Here is a sample of some of the clubs, activities and classes offered here. The Coral Cove neighborhood consists of four-story condo buildings with an outdoor reserved parking space. These units offer from 1,509 to 1,869 square feet. They have two bedrooms and two bathrooms as well as screened patios. Please Note: Floor plans are not available at this time. Regal Shores consists of two and four-story condo buildings. These units have two bedrooms plus a den, two bathrooms, and a reserved outdoor parking space. Units in the four-story building enjoy lake views, while the units in the two-story building have elevator access. Please Note: Floor plans are not available at this time. Crystal Pointe consists of attached homes that are designed as coach or villa homes. On the east side of Crystal Point are single-story attached villas with a one-car garage. On the west side of the neighborhood are coach homes that are two units on the first floor and two units on the second floor and each unit has a one-car garage. Please Note: Floor plans are not available at this time. Egret Pointe has single-story luxury patio homes with two or three bedrooms and a one-car garage. The Ibis II floor plan offers 1,654 square feet of living space with two or three bedrooms, two bathrooms, and an attached one-car garage. Royal Landings has elegant patio homes that offer two to three bedrooms and a one-car garage. Attached homes range in size from 1,600 square feet to 1,780 square feet of living space. Please Note: Floor plans are not available at this time. Regency Cove has single-family homes with attached two-car garages. These detached homes are all one-story with two or three bedrooms and two bathrooms. They vary in size from approximately 1,719 square feet to 2,176 square feet. Some models include a Florida Room while others have a roofed, screened porch. Tuscany neighborhood is comprised of single-family homes with two or three bedrooms and an attached two-car garage. They range from 1,700 to 2,300 square feet of living space. Please Note: Floor plans are not available at this time. Coral Lakes has been great for me. I am single and wanted a smaller place that I didn't have to spend a lot of time taking care of. My condo is just enough for me and I have plenty of time to use all the amenities. I spend most of my time at the clubhouse which is huge. It has everything I could want and lots of new things too. It motivated me to finally try my hand at pottery and I have also taken up photography. The people are nice and the friends I have made here are wonderful people. 55places.com is not affiliated with the developer(s) or homeowners association of Coral Lakes. The information you submit is distributed to a 55places.com Partner Agent, who is a licensed real estate agent. The information regarding Coral Lakes has not been verified or approved by the developer or homeowners association. Please verify all information prior to purchasing. 55places.com is not responsible for any errors regarding the information displayed on this website.